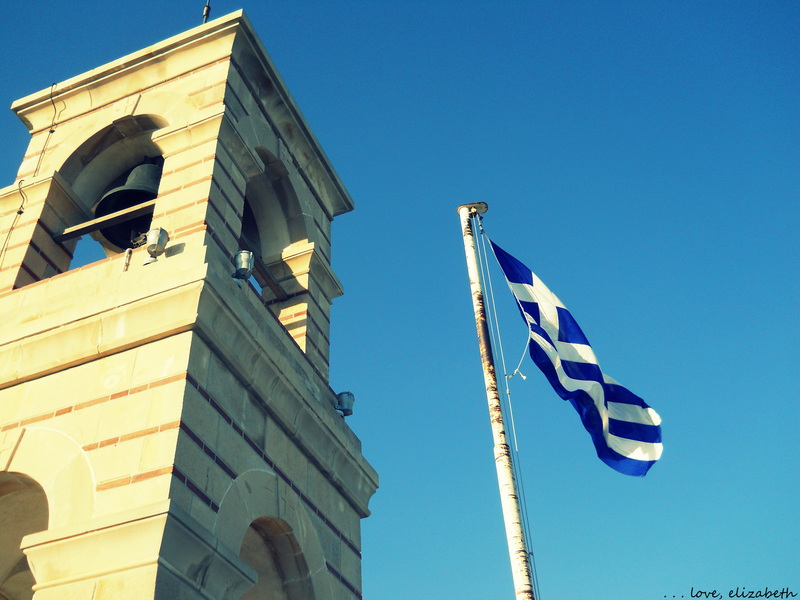 My little sister recently mentioned that the first place she wants to go when she’s old enough to travel to other countries is Greece. I started thinking about the few days I spent there last spring, and remembered one of my favorite travel stories. It was the last day of my spring break in Europe before I had to return to England for my essays and exams. I had just enough money left to treat myself to something nice, so I decided to walk around Athens until I found something to splurge on. 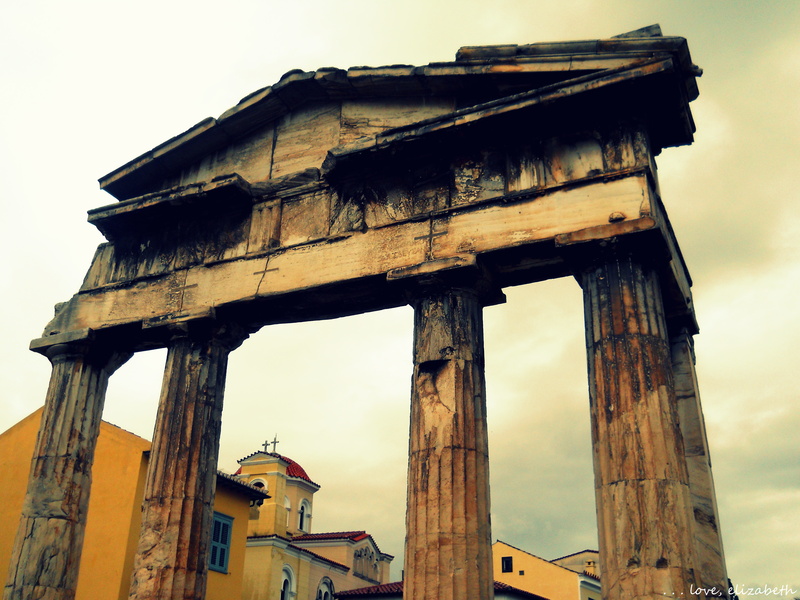 I walked up a deserted cobblestone street just around the corner from the Acropolis and saw a few restaurants. One of them had outdoor seating, and the host stood outside, presumably to welcome potential guests, though it was past lunch and he didn’t have anything to do at the moment. As I walked past, he struck up a conversation, and I decided my final splurge would be to treat myself to a nice Greek meal. After a month of eating cheap ready-made sandwiches and granola bars, this seemed like the most luxurious choice I could possibly make! We continued to talk as he sat me at a table in the warm sun (this was another luxury after almost a full month of traveling in rainy weather). 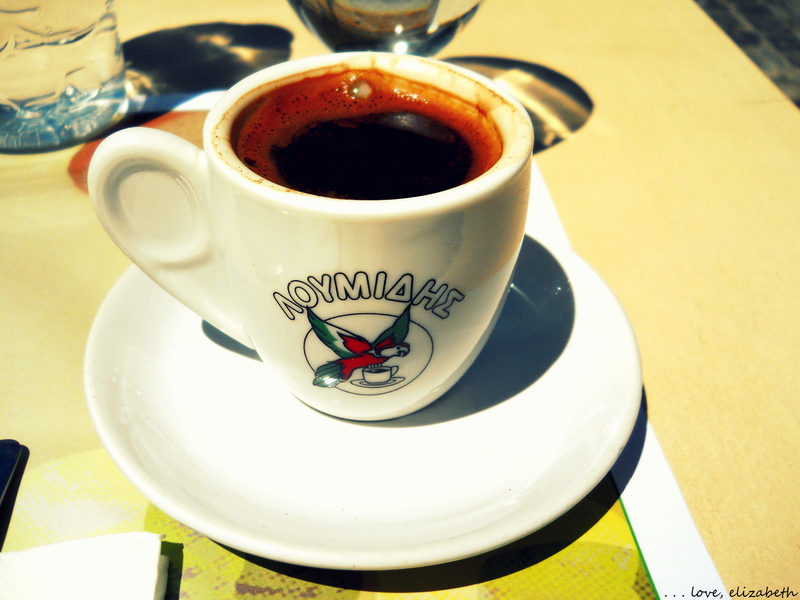 A waiter brought me a demitasse of Greek coffee as I looked over the menu. As I tried to figure out what dish sounded most delicious, the waiter and the host sat down and advised me on some of their specialties. They both recommended the moussaka, and so I ordered the vegetarian version of it. As the waiter took my order back to the kitchen, the host continued to talk to me, telling me his favorite things about Athens and some of his favorite places in Greece. Soon, the waiter came out with my food, and the two men left me alone while I ate. I thought about what an amazing month of travel it had been and enjoyed the sunlight and the view from my table. After I finished eating, the host returned to my table bearing a plate of dessert. “It is on the house today!” he declared, smiling. (I still don’t know what it was, but it was a sweet, honey-drenched cake and it was absolutely delicious.) 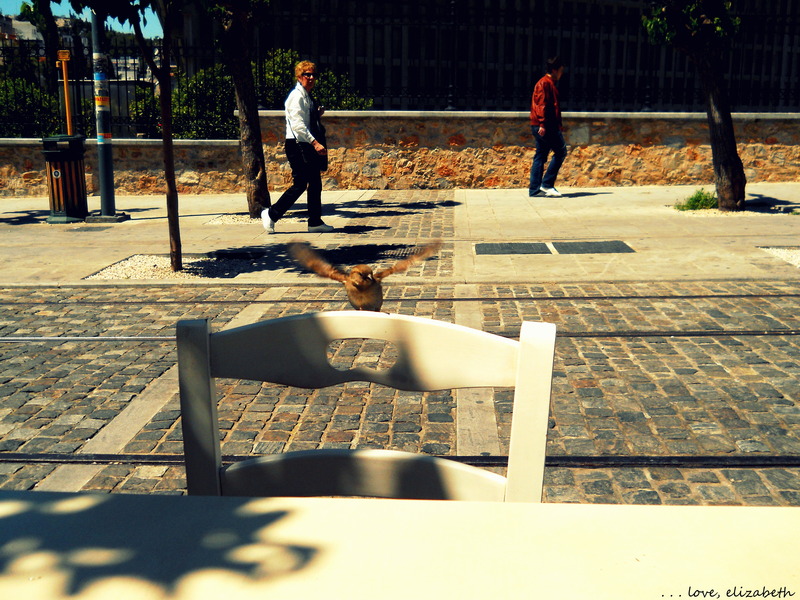 As I ate, several birds flew around my table, trying to get close to the cake. The waiter and the host both grabbed menus and gently swiped away the birds so that none of them could steal any of my dessert. I finished eating and said goodbye to all my new friends, winged and otherwise, savoring the perfect end to my wonderful holiday. Greece was a fantastic way to wind down from a busy few weeks of traveling, and my last meal was an unforgettable ending to Euro Trip 2012.